Setmore allows you to add a custom pop-up that will open for anyone who lands on your Booking Page. This is a quick and effective way to communicate essential information to your customers, right before they book an appointment. You may also add Terms & Conditions to your Booking Page, which will require customers to agree to a policy that you provide, before they can complete their booking. These settings are not currently available in the Setmore mobile app. However, once you activate them in the web app at https://my.setmore.com, customers will be able to see them when accessing your Booking Page from any mobile browser. Start by going to Apps & Integrations. 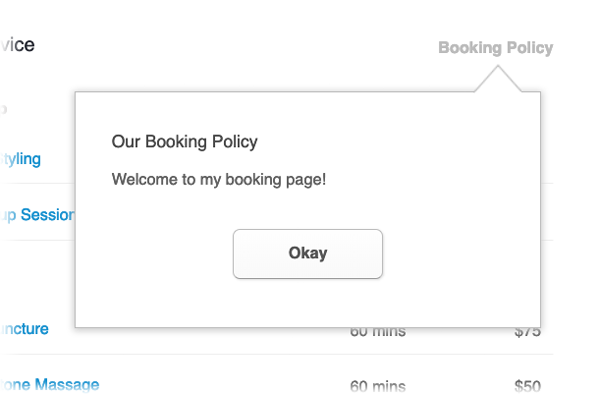 Under where it says Your Booking Page, click the Configure button, then click Booking Policies in the left navigation. Next, scroll to the section titled Notes for the Customer. Enter your message in the form field provided, then click outside the box to save your changes. Lastly, open your Booking Page in a new browser tab and verify that the pop-up is appearing with your preferred text. Note: Terms and Conditions will not appear if the customer is attempting to book a class session. Support for T&Cs on class bookings will be added at a later date. Next, scroll to the section titled Terms & Conditions. Enter label text and paste the web address of your terms and conditions, then click anywhere outside each form field to save your changes. Lastly, open your Booking Page in a new browser tab and create a test appointment. When you reach the "Enter Your Information" step, you'll notice a new checkbox that customers must agree to before continuing.